Motts Run Reservoir is an 860 acre natural area in Fredericksburg VA with a 160 acre lake. There are about 5 miles of trails with most of the trails being near or within viewable distance of the lake. For those who live close to Fredericksburg, this would be a great little hike if you don't have enough time to head to the mountains. The highlight of the trail is the Mine Run, a creek at the end of the Mine Run Trail, be sure to visit the creek and soak your feet in it during warmer weather. We hiked the trails to the North West of the parking lot first and then the trails to the South East. Mile 0.0 – From parking area head towards Nature Center on gravel road, pass Nature Center and come to first trail sign. Mile 0.1 – Turkey Ridge Trail (yellow blazed) intersection, stay straight, do not go right. Continue past 2 intersections of the Possum Path and reach the Mine Run Trail (red blazed). Mile 0.3 – Mine Run Trail, bear left reaching the Lakeview Trail (green blazed) in 0.3 miles. Mile 0.6 – Lakeview Trail, bear left for a 0.4 mile out and back for a nice view of the lake. Doing this and the Laurel Trail will give you a good workout down to the lake and back. Return to Mine Run Trail and bear left. Mile 1.2 – Laurel Trail (purple blazed), 0.2 mile out and back to the lake. Return to Mine Run Trail and bear left. Continue on Mine Run Trail until it ends at Mine Run. Mile 2.1 – Mine Run, eat a snack and soak your feet in the creek if you have time. Retrace your steps on the Mine Run Trail until the Turkey Ridge Trail. Mile 3.2 – Turkey Ridge Trail intersection, stay straight, do not go right. By-pass next intersection, spur trail to park road. Mile 3.3 – Spur Trail to park road, stay straight on trail and reach intial intersection of Turkey Ridge Trail. Mile 3.6 – Parking Lot and beginning of Part 2 of the hike. Head South East from the Parking Lot to the Hidden Creek Trail (blue blazed) near Picnic Site 4, very quickly bear to the left and head away from the lake. Mile 3.8 – Stay left at Intersection continuing up the Hidden Creek Trail, you will come back on the Hidden Creek Trail that is on the right here. We did not hike the Old Silo Trail that should be on your left in the next 0.1-0.2 miles, it is an out and back. Mile 4.1 – At next Intersection, “Shortcut”, stay straight heading down to the lake. Mile 4.3 – Reach view of lake then continue up hill towards the Osprey Point Trail. Mile 4.5 – Reach Osprey Point Trail (white blazed) Intersection, bear left back down to lake and nice bench overlooking lake, enjoy! Mile 4.9 – Bear left onto un-named trail following the lake to head back to Parking Lot. Mile 5.0 – Arrive at the parking area. Nice location and hike although we didn't take due to closure issues. So rating on location and other trails in community. Attempted to go here from Richmond today. But gates were locked as they are closed Tuesday and Wednesday as stated below. 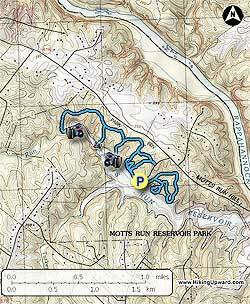 https://www.fredericksburgva.gov/Facilities/Facility/Details/Motts-Run-Reservoir-Recreation-Area-10 from the website: "Motts Reservoir is open Thursdays – Mondays, April 1 - October 31 from 7:00am - 7:00pm the Reservoir is CLOSED on Tuesdays and Wednesdays." We did enjoy looking at Rappahannock from the Public Boat landing at 38°18'49.2"N 77°32'27.8"W. Very nice view. People are mistaken when they say this is an easy hike. Yea if you stay on the listed trails. However the trails extend all the way around on the backside of the reservoir, almost all the way around the entire reservoir. A series of shorter trails. Great for kids. Reminds me of the hikes in Mason Neck State Park, except those are circuits and these are out and back. Trails are in good shape but, compared to mountainous hikes, i had to be more careful to not trip on roots. You're never far from the water, which is nice. As a previous reviewer wrote, it is open from 4/1 to 10/31. Note also that, at this time, the park is closed on Tuesdays and Wednesdays. It's a city park and if you search on "Motts Run Reservoir" you'll see the park site. There is a nice, detailed trail map you can download. You can also pick up a paper trail map at the boat concession stand. If you have a Virginia fishing license, you can fish for a small fee. Nice staff. New heated/air-conditioned restrooms -- something you don't see at every trailhead. Something to note: Motts Run Reservoir is only open from 04/01-10/31, so if you try to go at another time (like I did) you will find a locked gate. However, this isn't really that big of a deal, as it's a short hike either to the parking lot itself, or a little spur trail that directly hooks into the Turkey Run Trail, which I used as my start and end point, rearranging the hike slightly. The maintenance people that were there didn't seem to care that I was hiking around. I enjoyed this hike quite a bit, I can imagine that it is really nice (but probably super busy) during the summer, where it would make a great shady hike.